Katie & Lauren were absolutely incredible from the moment we met them! First, they are two outstanding and incredible people and made our relationship more a friendship rather than a contract - I could call/text/email them any silly question, and they would respond with the best advice or talk it through with us to make sure everything made sense. We had regular check ins - where they kindly made sure we were on track and had a detailed checklist to make sure nothing was forgotten. The wedding weekend was perfect, from the rehearsal and welcome bonfire on Friday, to every second of the wedding day - they have EVERYTHING covered (including many things we forgot in the end). Our wedding guests rave about our day and it would not have been possible without Summer Sisters. 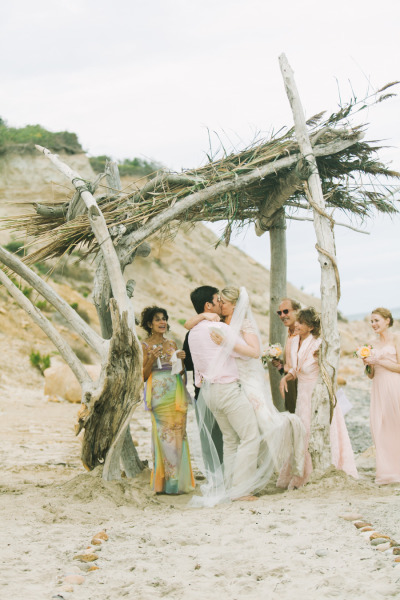 They have all the ins on Block Island and truly make the planning and wedding process on the island much easier. Plus now we have two new friends! My bride and I had the pleasure of using Summer Sisters for our July Wedding in 2016. This being our second marriages, working professionals, and that we were merging two families, we wanted to have a stress-free experience, and not get wrapped up in the details. Lauren & Katie were incredibly helpful in planning the wedding with vendors, the site and everything that went into making our day perfect! We could not be happier and would highly recommend them to anyone who wants to get married on Block Island. I couldn't have imagined my day without Katie and Lauren coordinating. I had planned a lot of DIY details that they meticulously executed the day of our wedding. I remember in the whirlwind of taking our pictures and seeing family and friends before the ceremony, I looked over and saw Lauren and Katie finishing all of the details on our seating place cards and thought to myself "YES". They were there from the beginning to the end and made the day the success it was! My life before the big day was made so much easier because of Katie and Lauren. They were always available and took care of all questions, concerns and requests. They made sure I remained stress-free, which allowed me to be an excited and mindful bride. Not many people who thought they could help pull off our crazy vision of this secluded beach location. Lauren and Katie never had any reservations and stuck with our plan. Guests loved the adventure and we can't thank them enough for helping to execute! There is no doubt that they will deliver. I can't say enough good things about Summer Sisters. I was having a pretty rough time planning my wedding, and during the haste, my awesome florist recommended that I reach out to Summer Sisters. Literally don't know how my wedding would have went if I hadn't. Katie was my savior. Seriously. She was on point with everything, and did everything I needed and more. She was also very proactive - helped me deal with things before they even happened. They are the absolute best. Would recommend them in a heartbeat!